This is no common fun-book. It is primarily a vocabulary-builder – with a difference. The difference lies in its approach. It contains hardly any text-book type of exercises. Rather, it is full of word-games, a large and interesting variety of them, that stimulate and challenge as they instruct and entertain. All the main items have been carefully devised to promote word-building. Matter that could go well in a volume of pure fun or in a puzzle-book, but would not be directly suited to our purpose, has been deliberately kept aside. Nevertheless, the fun remains. Readers with a fair knowledge of English can enjoy learning while playing! The exercises provide a good deal of fun. A Homonym is a word that is the same in form and sound as another but different in meaning. For example: the floor of a ship / decorate = DECK. Find homonyms from the clues given below. Take one letter out of the first word in the following pairs and add it to the second. Then rearrange the letters so that they form new words which are related to each other. For example, the answer to the first pair is: feel and taste. Here are some questions to test how well acquainted you are with some common proverbs. a. What is the best policy? b. What animals seldom bite? c. Who must not be choosers? There are various ways in which we take food into our mouth and work on it with our teeth before sending it down the gullet. There are severely synonyms of the word "eat", like, to gobble, to crunch, to bite, to peck, to chew..... Choose the appropriate word from each description given below. a. To cut or take hold of with teeth. b. To swallow food quickly without chewing it. Using only the letters of the phrase SAME CHILD find six-letter words that fit each of the descriptions below. The answer to (a) is CAMELS. 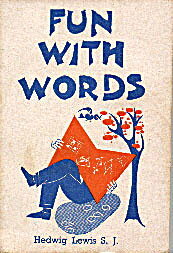 I came across this book 'Fun With Words' in our Library… It is a wonderful book.. I love the content.